We are hoping to offer Pistachios in 2013, subject to confirmation of supply from another grower. You can contact us to place your name on the list now (no payment neccessary until you receive confirmation from us in Autumn 2013). Apologies to all those who placed their name on the list last year and were unable to get trees……Still, never give up, never give up, never never never give up…. Offered as a pollinating pair – a male and female plant – the female variety is Sirora. 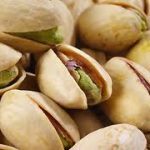 Pistachios are suited to marginal land, limited irrigation, and will do particularly well with a hot, dry, rainfree summer / autumn. They will grow in as little as 400 – 500 ml rainfall if widely spaced. Little pruning needed, and delicious end product.